Eureka gets jazzy this weekend as the Redwood Coast Jazz Festival returns, bringing music and dancing to six venues around town. The festive weekend starts Thursday, March 21, at 5 p.m. with A Taste of Main Street, where you can wander Old Town sampling wares from 24 different food producers, everything from sushi and pizza to pulled pork and organic gelato. (Call Eureka Main Street at 442-9054 for tickets.) That leads right into the Festival Kick Off Dance starting at 7 p.m. at the Adorni Center with rootsy rock and blues by The Delta Nationals, followed by Oregonian neo-swing big band High Street. The official opening ceremony is Friday at 1:30 p.m., a free show at the Eureka Theater featuring Buck Creek Reunion Band plus High Sierra Jazz Band with special guest Bob Draga on clarinet. As in years past, Draga will be roving all weekend playing with various bands. There's another free show that night in the Eureka High Auditorium with the Eureka High School Jazz Ensemble. The kids were supposed to open for The Commanders from Travis Air Force Base, but due to the federal sequester, that band had to cancel. The replacement: longtime festival favorites Blue Street Jazz Band, known as "The Bad Boys of Dixieland," plus guests Gordon and Brandon Au from the Au Brothers, a red hot jazz band out of Sacramento. You'll see the Aus throughout the fest: The brothers guest with other bands, the new-to-Humboldt Red Skunk Band includes Justin Au on trumpet, and the family band plays on its own. Looking for a break from all that jazz? Gator Beat mixes New Orleans R&B with zydeco and Cajun tunes; fiddler Tom Rigney and his band Flambeau push the boundaries of neo-traditional Cajun music. If you're just planning on going to one show, the Saturday night dance party at the Muni might be the ticket. The lineup includes Frisco-based jump swing band Lost Dog Found, the Au Brothers, Red Skunk (with all three of the brothers Au), as well as neo-swingers Stompy Jones, a longtime festival favorite. If you're not too worn out from dancing the night away Saturday, Blue Street Jazz Band plays a free program of hymnals at the Adorni Center first thing Sunday morning (8:30 a.m.). Most venues close at 2:30 p.m. Sunday; the exception is the "Grand Finale" at the Muni, a showcase with half a dozen bands and guests playing short sets. 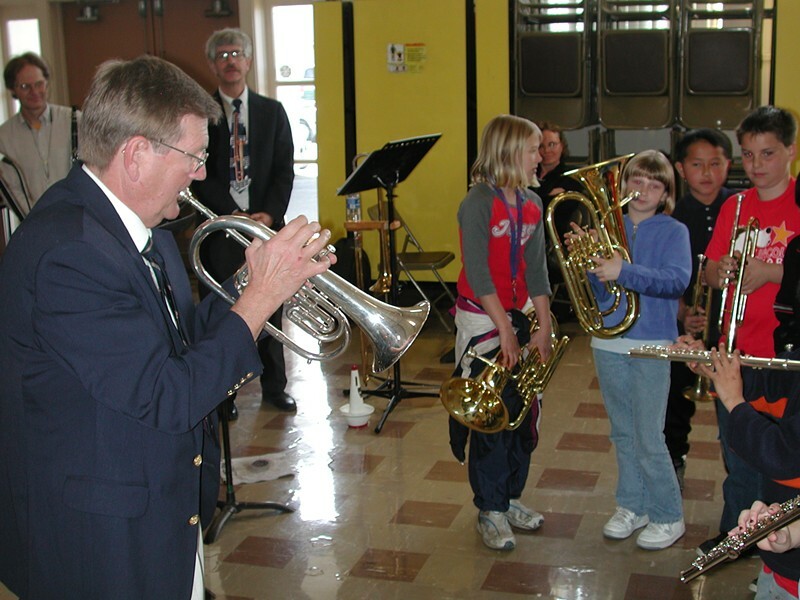 This year's fest is dedicated to the late Don Moehnke, a tireless teacher and jazz supporter, and a fine trumpet player. As usual the line-up includes a number of youth bands from local high schools and junior highs. Incidentally, you'll find Don's (grown) son, Bill Moehnke, all over the festival. He plays drums for local trad band The Hall Street Honkers, and for The Uptown Kings blues band; he's also sitting in as drummer for The Au Brothers. And don't miss the rest of the Humboldt County contingent: The Horn Band and Donna Landry and Swingset, bands that keep the dancers dancing all year 'round. The ticket pricing structure is complicated, with different prices for all weekend, single days, "prime time" one evening tickets, even a single venue tickets for the Eureka Theater and, of course, a good deal for youth (ages 13-23). 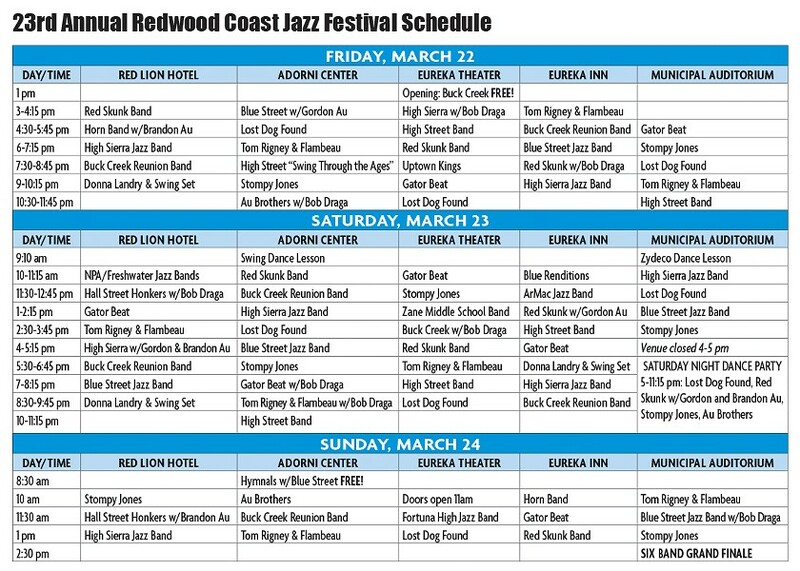 Full details at www.redwoodjazz.org or call the Redwood Coast Music Festivals office at 445-3378. See you on the dance floor.